As of February 1st, the methadone provided by pharmacists in BC has changed to a solution that is 10 times more concentrated so patients will receive a smaller volume to drink, only one-tenth of what they used to receive. The new formula, called Methadose, is also a different colour, red and cherry-flavoured instead of orange. Because of the increase in concentration, there is a risk of overdose among prescription users and those who buy it on the street so we are encouraging everyone to help raise awareness about this change. The new Methadose comes pre-mixed or compounded so pharmacists will no longer need to prepare the solution themselves. People in the methadone maintenance treatment (MMT) program may ingest the drug right at the pharmacy or it can be prescribed to take home as “carries.” These carries are now dispensed in small, child-proof bottles each containing a daily dose of the cherry-flavoured liquid. The bottles do not need refrigeration running the extra risk that they could be mistaken for cough syrup or other over-the-counter medication. Methadone should be stored in locked boxes away from the reach of children or pets. 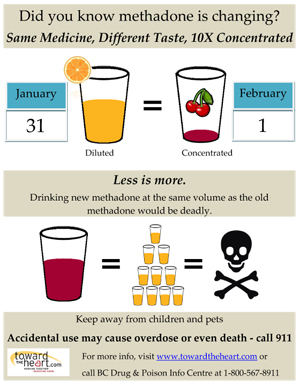 It is important that the public, particularly those who are on methadone maintenance therapy, be aware of the changes and take extra caution during this transition. There are almost 15,000 people enrolled in BC’s MMT program to help ease withdrawal symptoms and treat their addiction to heroin or other opioid drugs. MMT is recognized internationally as among the most effective treatments for opioid dependency. Providing methadone maintenance treatment (MMT) is estimated to save $39,000 per person each year in the social costs associated with opioid addiction, such as drug-related crime, jail time and medical treatment. We’ve developed an online tool to help service providers and the general public find out where they can pick up sterile supplies for safe injection and inhalation, as well as get naloxone training in their communities. Our heartfelt gratitude to the amazing GIS team at BCCDC. Thank you Sunny Mak, Charles Fritz and Mieke Fraser for all your efforts in making this possible! Naloxone is a safe and effective medication that can quickly reverse an opioid overdose. The BC Centre for Disease Control launched the BC Take Home Naloxone (THN) pilot program in August 2012 to provide overdose prevention and response training to people at risk and their friends and family. It is the only provincial program that has been continuously operational for 18 months. Kamloops’ Royal Inland Hospital is the first Canadian ER to provide training and dispense kits to people who come in due to an opioid overdose. 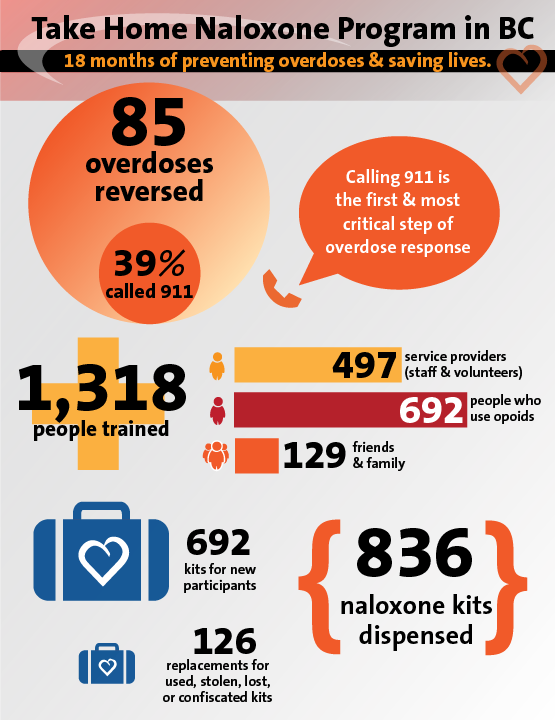 With 85 overdose reversals, 1,318 people trained and 836 naloxone kits dispensed so far, it's off to a great start! In our sixth e-Zine, we bring you a nifty naloxone program infographic and highlight new supplies and policy changes coming this spring. We check in on the results of an annual BC-wide drug survey and other important harm reduction research. Finally, learn what your Health Authority is doing with funds for strengthening peer and community services. It is crucial that the public be aware of the increased concentration of methadone to ensure no accidental overdoses. We have created posters in English, Punjabi and Simplified Chinese to help get the word out. Our web campaign generated record-breaking traffic to our website and was shared through social media 132 times. Keep it going! 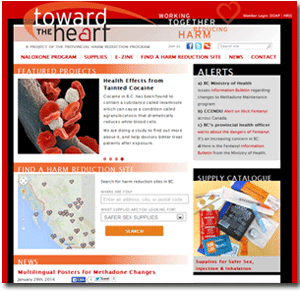 We’ve updated our website to go along with the new Harm Reduction Site Finder. Kudos to Hello Cool World for their great work! "I let anybody who uses [opioids/drugs] and comes into my home know exactly where the kit is and how to administer the naloxone. It is very important." "The Take Home Naloxone program does not 'enable' or 'encourage' substance use and/or abuse anymore than wearing a seat belt enables a car crash. Providing clients with the education and means to save their, or someone else’s, life is very empowering." "Overdose happens here at VANDU from time to time and when they do, we have capable peer staff to call 911, administer naloxone and conduct CPR if necessary."